Summer means lots and lots of BBQs, all American menus and of course tons of potato salad. My husband will eat potato salad in just about any form but I find most people rely on the same standard recipe with a mayo base, some celery, maybe some onion, and dill. Not bad, and when done well it can be terrific, but also pretty boring after a while. Since we are about midway through summer (gasp!) I thought some of you may be getting a little tired of the same old as well. Here are a selection of really delicious and different potato salads that I like to make to keep things interesting. The arugula pesto one is something I created on my own – it makes enough for this salad and a bit more which is great. It’s delicious slathered on bread, tossed with pasta or even mixed with some greek yogurt as a dip for pita or crudites. The potato cooking technique I got from Ina and it really does make for perfectly cooked potatoes that you could use in any salad. Does anyone have a fun twist on the potato salad they can share?? Grilled Potato Salad with Arugula, Goat cheese, and Lemon Mustard Tarragon vinaigrette – This potato salad by Bobby Flay is the featured photo and SO amazing. I saw it on his show Barbeque Addiction and immediately pinned it so I could make it later. I served it with a carrot ribbon salad (post coming soon) and used the delicious vinaigrette on that as well. It would make a great side to grilled chicken or even a nice steak. French Potato Salad – This is one I keep coming back to over the years. Sometimes I change it up by switching out the hebs to others I have on hand but I find that the spalsh of white wine really adds something to the flavor of this. Who was ever hurt by a spalsh of wine? Its a great salad for when its really hot out and you dont want to have anything creamy. Spanish Style Grilled Pepper Potato Salad – I had to include at least one recipe that had mayo in it and here it is. The addition of the grilled peppers and lots of garlic keeps this one from being boring. If you have some smoked paprika (otherwise known as pimenton) on hand, throw a teaspoon into the mayo to add even more flavor and a wonderful red color. Put the potatoes and some kosher salt in a pot and cover with cold water. Bring the water to a boil and then lower the temperature to a simmer and cook the potatoes for 12 or so minutes. While the potatoes cook, add the pistachios, parmesan, lemon juice and zest, and arugula to the food processor. Process it until well combined then pout in the olive oil until it forms a pesto. 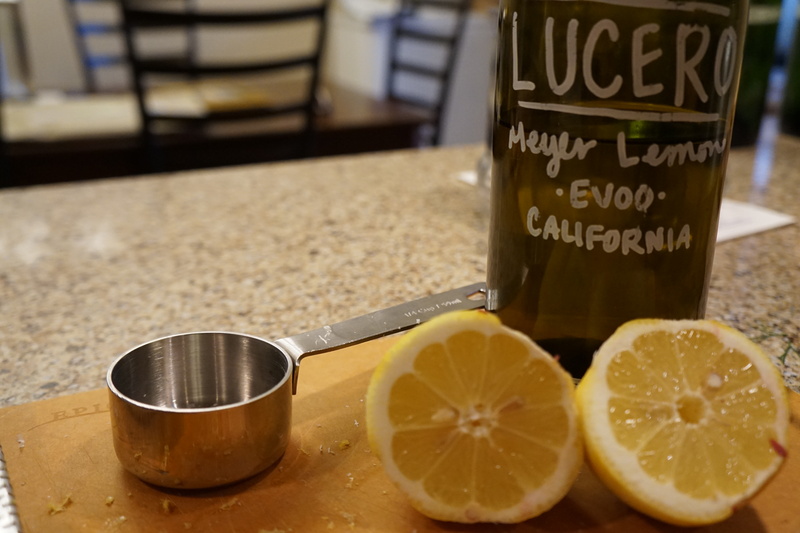 I used this delicious meyer lemon olive oil that I had on hand to really pump up the lemon flavor but regular olive oil will work just as well, just make sure to use a good fruity one. Use a toothpick to test the potatoes to see if they are done (this will depend a bit on the size of the potatoes – ideally they should all be roughly the same so they cook evenly). Drain the potatoes in a colander and place over the pot. Cover the colander with a clean dish towel and let them steam for 10 minutes. Let them cool enough for you to handle and cut into halves or quarters. Toss with just enough pesto to cover. The leftover pesto will keep in the fridge for 3 to 4 days. The potato salad can be served hot or at room temperature. You can make it a day in advance, just let it come to room temperature before serving. Put the potatoes and some kosher salt in a pot and cover with cold water. Bring the water to a boil and then lower the temperature to a simmer and cook the potatoes for 12 or so minutes. While the potatoes cook, add the pistachios, parmesan, lemon juice and zest, and arugula to the food processor. Process it until well combined then pout in the olive oil until it forms a pesto. Use a toothpick to test the potatoes to see if they are done (this will depend a bit on the size of the potatoes – ideally they should all be roughly the same so they cook evenly). Drain the potatoes in a colander and place over the pot. 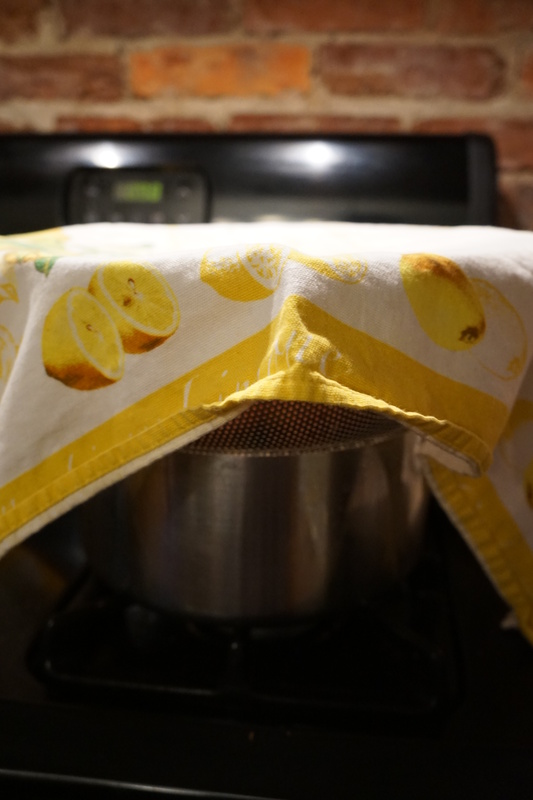 Cover the colander with a clean dish towel and let them steam for 10 minutes. Let them cool enough for you to handle and cut into halves or quarters. 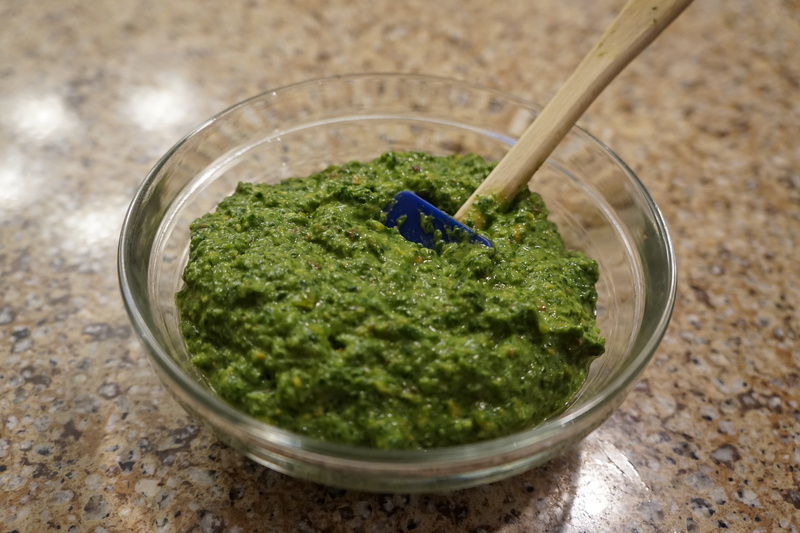 Toss with just enough pesto to cover. The leftover pesto will keep in the fridge for 3 to 4 days. The potato salad can be served hot or at room temperature. You can make it a day in advance, just let it come to room temperature before serving. Please keep the summer salads coming. I need them for summer entertaining in the country. I’m going to try some of these potato salads on guests this month. I was just trying to figure out how to make the weekend more interesting for some meat & potato friends.